Clinic Synopsis: This clinic session introduces a "new wave" comprehensive curriculum for teaching percussion that includes strategies for when and how to introduce each instrument to beginning percussion students. His teaching philosophy and use of this curriculum have played important roles in the success of his students and have provided a consistent foundation for one of the premier percussion programs in the United States of America. Clinician Biographical Information Kennan Wylie serves as director of percussion studies at Marcus High School in Flower Mound, Texas. During his tenure, the percussion program has achieved national acclaim both on the field and in the concert hall. 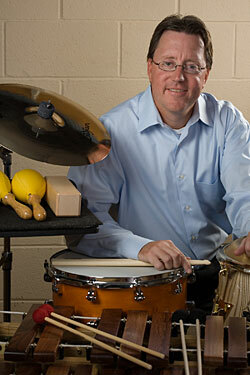 Wylie served as an adjunct professor of percussion for ten years at the University of Arlington at Texas. He currently serves as president of the Texas Percussive Arts Society Chapter and is a free-lance performer in the DFW area. Wylie publishes his own quality percussion literature for the beginning percussionist through K. Wylie Publications. He is also an educational endorser for Zildjian Cymbals, Innovative Percussion, Evans Drumheads, and Yamaha Corporation.